Once seen as a tool for alien-blasting gamers, movie studios, television producers and artists are now adopting the technology, which immerses people in faraway realms using bulky goggles, house-sized domes, and smartphones. Entering a virtual world means that users who look left, right, up or behind experience an alternate environment, even when they’re sitting in a theater or on a couch. It means a horror movie can be promoted with a haunted house tour featuring a mass murderer who can spring from anywhere. Or a shark documentary enhanced by the sensation that you’re being circled by predators. “What’s better for jump scares than, like, turning your head and it’s right in your face?” says Matt Lipson, senior vice president of digital marketing at Focus Features. Virtual reality may not appear at your local multiplex soon, but it’s being used to lure you there. Universal’s Focus Features recently launched its first virtual-reality experience for movies, promoting the upcoming release of its “Insidious: Chapter 3” horror flick. It’s driving a truck around the country, inviting fans to wear virtual-reality goggles. It’s also sent out thousands of movie-branded Google Cardboard kits, which fold around smartphones to turn them into primitive VR viewers. Fans can download the app from Google Play, or the App Store, to make it work. In the “Insidious” VR experience, viewers sit in a haunted house across from a psychic. Various scares appear from the right and left and, in the end, there is a close-up encounter with an undead serial killer known as the Bride in Black. Lionsgate used a similar approach for its “Insurgent” movie. It applied VR to try to widen the film’s fan base beyond young women, to male fans of action movies. Using VR was one way to appeal to gamers, who are mostly men and are expected to be the first buyers of VR headsets. VR remains the realm of promotion. But content created now or for future films could also build value for home video products as more VR headsets are sold, Lipson says. And the number of outlets for virtual reality is increasing. Oculus VR, the company Facebook bought for $2 billion and a leader in the VR headset market, is expected to start shipping a consumer version early next year. It’s already sold 150,000 goggles as test units for content developers. Samsung, meanwhile, is selling Gear VR, which works with Galaxy S6 smartphones. Sony will release a consumer version of its Project Morpheus, which connects to its PlayStation 4, in the first half of next year. Oculus’s goal is to get headsets into as many hands as possible, says co-founder and head of product Nate Mitchell. The company set up a division of experimental filmmakers called Oculus Story Studio to help other filmmakers learn how to create VR video. Facebook is testing what CEO Mark Zuckerberg calls “spherical video,” or a flat representation of immersive content that could be navigable by mouse on its website. Google’s YouTube launched support for “360-degree video” on Chrome browsers and Android phones in March and is providing VR camera rigs for its partners at its six studios. Fold-up Google Cardboard units can be bought online for as little as $2.46. Discovery Communications is also planning to launch VR content under the Discovery Virtual brand in August. Teams are already shooting off the Bahamas in preparation for “Shark Week” in July, says Conal Byrne, Discovery’s senior vice president of digital media. Fans of the series are used to watching the circling predators from inside a protective cage. But virtual reality would heighten the fear factor, as sharks could cruise by while your head is turned elsewhere. “This feels like the perfect opportunity for virtual reality to say, ‘Now let’s really put you inside this world,'” Byrne says. Part of the experiment is seeing what works creatively, including not making people sick. 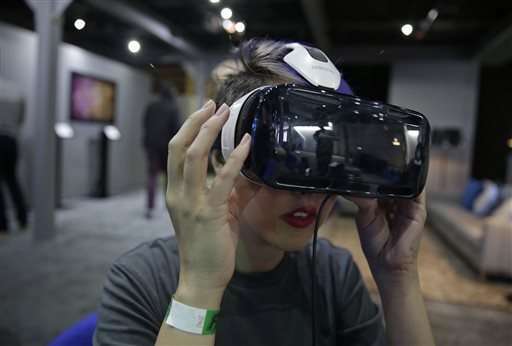 The other part is trying to determine how to make virtual reality a business, Byrne says. That could include advertising, putting commercial products inside virtual worlds, and giving fans another reason to watch TV shows. Another virtual frontier to cross is creating environments for groups, not just individuals, in the same way that theaters provide a community experience. That possibility was tested out on a recent evening, when eight art school students gathered under a dome in downtown Los Angeles. They were preparing an immersive show projected on a 19-foot-high hemisphere. It’s all part of creating a new cinematic language that doesn’t just play out on the screen in front of you, but is interactive and immersive, said Prof. Hillary Kapan, who put on the class for the California Institute of the Arts.